Delta will take the 747 on an employee farewell tour from Detroit to Seattle/Tacoma on December 18, 2017 Seattle/Tacoma to Atlanta on December 19, 2017 and Atlanta to Minneapolis-St. Paul on December 20, 2017. Customers can bid for a spot on these farewell flights via SkyMiles Experiences using their SkyMiles. Employees and retirees can purchase a seat on these flights on a first-come, first-serve basis beginning at noon ET November 20, 2017 at a discounted rate, with all proceeds going to the Airloom Project, the organization behind the 747 Experience exhibit at the Delta Flight Museum. The 747 will fly a handful of sports team and ad-hoc charter flights through December 31, 2017. 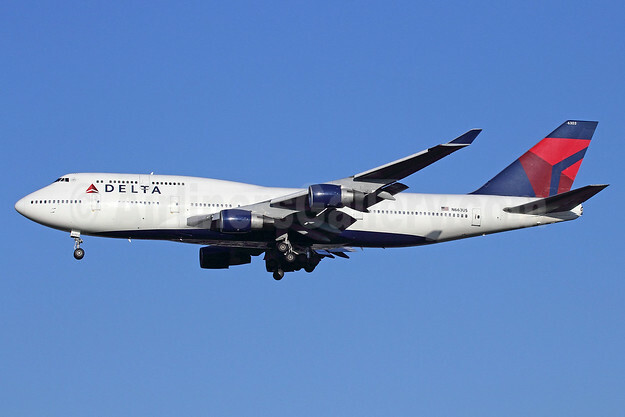 Delta will fly its final Boeing 747 to its retirement place in Arizona in early January. This ferry flight will not be open to passengers. Copyright Photo: Delta Air Lines Boeing 747-451 N663US (msn 23818) NRT (Michael B. Ing). Image: 913462. Bottom Copyright Photo: It all started with the Boeing 747-132s (below) and later with the ex-Northwest Boeing 747-451s (above). Delta Air Lines Boeing 747-132 N9896 (msn 19896) MIA (Bruce Drum). Image: 101068. This entry was posted in Delta Air Lines and tagged Boeing 747-132, Boeing 747-451, Delta Air Lines, MIA, msn 19896, msn 23818, N663US, N9896, NRT on November 14, 2017 by Bruce Drum. Delta customers and employees began saying their goodbyes to the airline’s iconic Boeing 747-400 fleet as the aircraft operated its final Tokyo-Narita to Honolulu flight. It then made a rare appearance on two domestic flight legs earlier this month. After arriving in Honolulu from Tokyo-Narita for the last time, the aircraft was routed through Los Angeles on its way back to Detroit. The flights from Honolulu to Los Angeles and Los Angeles to Detroit were expected to be the final domestic 747 flights by any U.S. airline before two 747s were sent from Detroit to Orlando last week to help assist with Hurricane Irma evacuation efforts. Employees in Honolulu paid tribute to the aircraft, which regularly operated the Honolulu-Narita route, with traditional Hawaiian customs by fashioning a maile lei big enough to fit over the top of the aircraft as a sign of respect (below). The team also held a gate celebration, and several employees held back tears as the group sang Aloha Oe and watched the aircraft depart Honolulu for the last time. Photo Above: Delta Air Lines. The Los Angeles team also had a chance to say their goodbyes to the “Queen of the Skies.” Employees lined the ramp at LAX and waved orange wands as it made its late-night departure to Detroit. Employees in Detroit met the aircraft when it landed, though the 747 will continue flying through Detroit for a few more months. A group of 50 Delta Diamond Medallion customers joined in on the festivities as well. 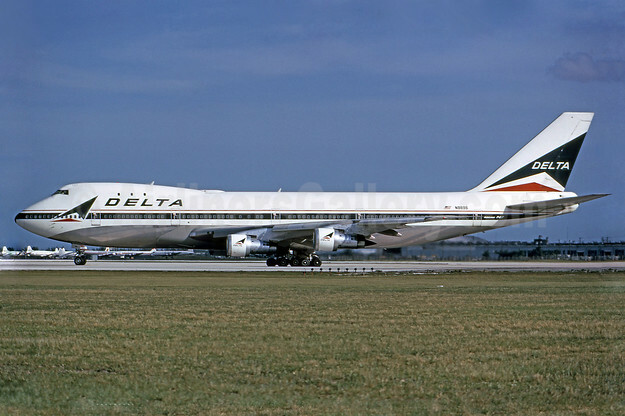 When one member of a Diamond Medallion Facebook group saw that the 747 would be flying two domestic legs, he notified other members of the group, who jumped at the chance to take one last flight on the aircraft. The group booked nearly the entire Delta One cabin and some of the Main Cabin as well, and they flew in from all over the country to catch one last ride on the 747. ​​Additionally, employees in Los Angeles hosted a reception for the group in the Delta Sky Club, and each member of the group received model 747 aircraft as a parting gift. All customers on the flight received commemorative ear buds in celebration of the final scheduled domestic flight. Delta expects the remaining 747s in its fleet to be retired by the end of 2017. The retiring aircraft will be replaced by the Airbus A350. 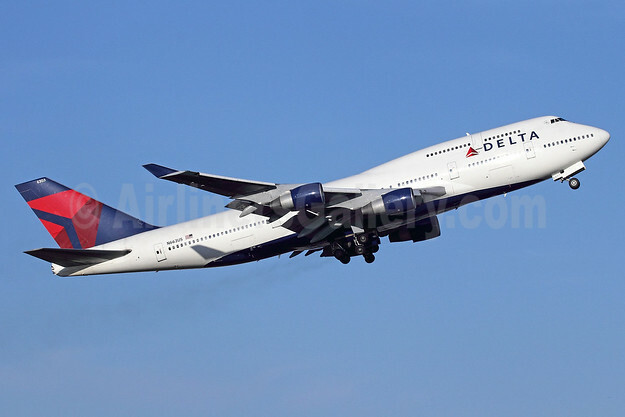 Top Copyright Photo: Delta Air Lines Boeing 747-451 N663US (msn 23818) NRT (Michael B. Ing). Image: 913623. This entry was posted in Delta Air Lines and tagged 747, 747-400, Boeing, Boeing 747, Boeing 747-400, Boeing 747-451, Delta Air Lines, msn 23818, N663US, NRT on September 18, 2017 by Bruce Drum. Delta Air Lines (Atlanta) today suspended all flights to Tel Aviv, Israel due to nearby rocket attacks according to CNN. Today’s flight DL 469 from New York (JFK) diverted to Paris (Charles de Gualle). The suspension is for 24 hours. The U.S. Department of State warns U.S. citizens of the risks of traveling to Israel, the West Bank and Gaza due to ongoing hostilities. The Department of State recommends that U.S. citizens consider the deferral of non-essential travel to Israel and the West Bank and reaffirms the longstanding strong warning to U.S. citizens against any travel to the Gaza Strip. This Travel Warning replaces the Travel Warning issued on February 3, 2014. The security environment remains complex in Israel, the West Bank, and Gaza, and U.S. citizens need to be aware of the risks of travel to these areas because of the current conflict between Hamas and Israel. The Department of State continues its longstanding strong warning to U.S. citizens against travel to the Gaza Strip; U.S. government employees are not allowed to conduct official or personal travel there. Please see the section below on the situation in the Gaza Strip. Because of the security situation, the U.S. Embassy in Tel Aviv and its annexes are currently operating at reduced staffing and the Consular Section of the Embassy is providing only emergency consular services. The U.S. Consulate General in Jerusalem is currently maintaining normal operations, including consular services. Long-range rockets launched from Gaza since July 8, 2014 have reached many locations in Israel – including Tel Aviv, cities farther north, and throughout the south of the country. Some rockets have reached Jerusalem and parts of the West Bank, including Bethlehem and Hebron. While many rockets have been intercepted by the Iron Dome missile defense system, there have been impacts that have caused damage and injury. In light of the ongoing rocket attacks, U.S. citizen visitors to and U.S. citizen residents of Israel and the West Bank should familiarize themselves with the location of the nearest bomb shelter or other hardened site, if available. Visitors should seek information on shelters from hotel staff or building managers. Consult city municipality websites, such as those for Jerusalem and Tel Aviv, for lists of public bomb shelters and other emergency preparedness information. Visitors should follow the instructions of the Home Front Command on proper procedures in the event of rocket attacks. Travelers should avoid areas of Israel in the vicinity of the Gaza Strip due to the real risks presented by small arms fire, anti-tank weapons, rockets, and mortars, as attacks from Gaza can come with little or no warning. Both Embassy and Consulate General personnel are currently not permitted to travel south of greater Tel Aviv without prior approval. On July 17, 2014 Israel announced the commencement of ground operations in Gaza. Visitors to these areas should remain aware of their surroundings and should take note of announcements and guidance provided by the Home Front Command. Ben Gurion Airport is currently open and commercial flights are operating normally, although delays and cancellations can occur. Travelers should check with their airline prior to their planned travel to verify the flight schedule. U.S. citizens seeking to depart Israel or the West Bank are responsible for making their own travel arrangements. Consulate General’s ability to provide assistance. U.S. government personnel are restricted from conducting personal travel to most parts of the West Bank; travel for official business is done with special security arrangements coordinated by the U.S.
U.S. government personnel are not permitted to use public buses anywhere in Israel or the West Bank due to past attacks on public transportation. Personal safety conditions in major metropolitan areas, including Tel Aviv and Haifa and their surrounding regions, are comparable to or better than those in other major global cities. Please see below for specific information regarding Jerusalem. Visitors should observe appropriate personal security practices to reduce their vulnerability to crime, particularly late at night or in isolated or economically depressed areas, including in the countryside. Visitors are advised to avoid large gatherings or demonstrations and keep current with local news, which is available through numerous English language sources. The Government of Israel has had a long-standing policy of issuing gas masks to its citizens and, starting in 2010, it began issuing replacement masks. It stopped this distribution process in early 2014 in response to regional events. Visitors and foreign residents in Israel are not issued masks and must individually procure them, if desired. The U.S. Embassy and Consulate General do not provide gas masks for persons who are not U.S. government employees or their dependents. For further emergency preparedness guidance, please visit the website of the Government of Israel’s Home Front Command, which provides information on how to choose a secure space in a home or apartment, as well as a list of the types of protective kits (gas masks) issued by the Government of Israel to its citizens. The Department of State recommends against travel to areas of Israel in the vicinity of the Gaza Strip. Travelers should be aware of the risks presented by the current military conflict between Hamas and Israel. On July 17, 2014 Israel announced the commencement of ground operations in Gaza. Travelers in the regions immediately bordering Gaza may encounter small arms fire, anti-tank weapons, rockets, and mortars launched from inside Gaza toward Israeli cities and towns. These attacks can come with little or no warning. Visitors to these areas should remain aware of their surroundings and of the location of bomb shelters and should take note of announcements and guidance provided by the Home Front Command. Travelers should also be aware of the heightened state of alert maintained by Israeli authorities along Israel’s border with Egypt. There have been cross-border incidents from Egypt, including rocket attacks and ground incursions, such as an attack that took place in August 2013 and one on January 20, 2014. Rockets were fired from Sinai in the direction of Eilat on July 15, 2014. Rocket attacks into Israel from Lebanon have occurred without warning along the Israeli-Lebanese border. Tensions have increased along portions of the Disengagement Zone with Syria in the Golan Heights as a result of the internal conflict occurring in Syria. Sporadic gunfire has occurred along the border region. There have been several incidents of mortar shells and light arms fire impacting on the Israeli-controlled side of the zone as a result of spillover from the fighting in Syria. Travelers should be aware that cross-border gunfire can occur without warning. Furthermore, there are active land mines in areas of the Golan Heights, so visitors should walk only on established roads or trails. The Syrian conflict is sporadic and unpredictable. U.S. government personnel must notify the Embassy’s Regional Security Office in advance if they plan to visit the Golan Heights and are prohibited from traveling east of Rt. 98 in the Golan Heights. U.S. citizens should be aware of the possibility of isolated street protests, particularly within the Old City and areas around Salah Ed-Din Street, Damascus Gate, Silwan, and the Sheikh Jarrah neighborhood. Travelers should exercise caution at religious sites on Fridays and on holy days, including during Ramadan. U.S. government employees are prohibited from entering the Old City on Fridays during the month of Ramadan due to congestion and security-related access restrictions. U.S. government employees are prohibited from transiting Independence Park in central Jerusalem during the hours of darkness due to reports of criminal activity. The Consulate General notes that recent demonstrations and clashes in several East Jerusalem areas, such as Shufat, Beit Hanina, Mt. of Olives, As Suwaneh, Abu Deis, Silwan, Shuafat Refugee Camp, inside the Old City (near Lions Gate), Issawiyeh, and Tsur Baher appear to have diminished, although the possibility exists of renewed clashes in the same areas during evenings. We note that the clashes and demonstrations have not been anti-American in nature. The Israel National Police (INP) continues to have a heavy presence in many of the neighborhoods that have had clashes and may restrict vehicular traffic to some of these neighborhoods without notice. We advise citizens not to enter any neighborhoods restricted by the INP and to avoid any locations that have active clashes ongoing. The Shufat neighborhood of Jerusalem remains off-limits for official U.S. personnel and their families at night until further notice. The Old City of Jerusalem is also off-limits every day after dark for official U.S. personnel and their families until further notice. Official U.S. personnel are restricted from the Old City of Jerusalem at all times on Fridays during Ramadan. The Friday restriction is part of our standard policy, due to overall congestion and large crowds, and is not related to recent events. The Department of State urges U.S. citizens to exercise caution when traveling to the West Bank. Demonstrations and violent incidents can occur without warning, and vehicles are regularly targeted by rocks, Molotov cocktails, and gunfire on West Bank roads. U.S citizens have been killed in such attacks. There have also been an increasing number of violent incidents involving Israeli settlers and Palestinian villagers in the corridor stretching from Ramallah to Nablus, including attacks by Israeli settlers on Palestinian villages in which U.S. citizens have suffered injury or property damage, and attacks by Palestinians on settlements. U.S. citizens can be caught in the middle of potentially dangerous situations, and some U.S. citizens involved in political demonstrations in the West Bank have sustained serious injuries. The Department of State recommends that U.S. citizens, for their own safety, avoid all demonstrations. During periods of unrest, the Israeli Government may restrict access to the West Bank, and some areas may be placed under curfew. All persons in areas under curfew should remain indoors to avoid arrest or injury. Security conditions in the West Bank may hinder the ability of consular staff to offer timely assistance to U.S. citizens. Personal travel in the West Bank by U.S. government personnel and their families is permitted to the towns of Bethlehem and Jericho and on Routes 1, 443, and 90. Personal travel is also permitted to Qumran off Route 90 by the Dead Sea, as are stops at roadside facilities along Routes 1 and 90. All other personal travel by U.S. government personnel in the West Bank is prohibited. U.S. government personnel routinely travel to the West Bank for official business, but do so with special security arrangements. The Department of State strongly urges U.S. citizens to avoid all travel to the Gaza Strip, which is under the control of Hamas, a foreign terrorist organization. U.S. citizens in Gaza are advised to depart immediately. The security environment within Gaza, including its border with Egypt and its seacoast, is dangerous and volatile. Exchanges of fire between the Israel Defense Forces and militant groups in Gaza take place regularly, and civilians have been caught in the crossfire in the past. Although the Rafah crossing between Gaza and Egypt normally allows for some passenger travel, prior coordination with local authorities — which could take days or weeks to process — is generally required, and crossing points may be closed for days or weeks. Travelers who enter the Gaza Strip through the Rafah crossing must also exit through the Rafah crossing, and those entering the Gaza Strip may not be able to depart at a time of their choosing. Many U.S. citizens have been unable to exit Gaza or faced lengthy delays in doing so. Furthermore, the schedule and requirements for exiting through the Rafah crossing are unpredictable and can involve significant expense. Because U.S. citizen employees of the U.S. government are not allowed to enter the Gaza Strip or have contact with Hamas, the ability of consular staff to offer timely assistance to U.S. citizens, including assistance departing Gaza, is extremely limited. Some U.S. citizens holding Israeli nationality, possessing a Palestinian identity card, or who are of Arab or Muslim origin have experienced significant difficulties in entering or exiting Israel or the West Bank. U.S. citizens planning to travel to Israel, the West Bank, or Gaza should consult the detailed information concerning entry and exit difficulties in the Country Specific Information. Contact the Consular Section of the U.S. Embassy for information and assistance in Israel, the Golan Heights, and ports of entry at Ben Gurion Airport, Haifa Port, the northern (Jordan River/Sheikh Hussein) and southern (Arava) border crossings connecting Israel and Jordan, and the border crossings between Israel and Egypt. An embassy officer can be contacted at (972) (3) 519-7575 from Monday through Friday during working hours. The after-hours emergency number is (972) (3) 519-7551. Contact the Consular Section of the U.S. Consulate General in Jerusalem for information and assistance in Jerusalem, the West Bank, the Gaza Strip, and the Allenby/King Hussein Bridge crossing between the West Bank and Jordan, at (972) (2) 630-4000 from Monday through Friday during working hours. The after-hours emergency number is (972) (2) 622-7250. Copyright Photo: Michael B. Ing/AirlinersGallery.com. Boeing 747-451 N663US (msn 23818) prepares to land in Tokyo (Narita). This entry was posted in Delta Air Lines and tagged 23818, 747, 747-400, 747-451, Boeing, Boeing 747, Boeing 747-400, Delta Air Lines, Department of State, Gaza, Gaza Strip, Golan Heights, Israel, N663US, Narita, NRT, Tel Aviv, Tokyo, U.S. Department of State, West Bank on July 22, 2014 by Bruce Drum. Delta Air Lines (Atlanta) will launch international Wi-Fi service on flights 283 and 295 equipped with Ku-band satellite Wi-Fi on Boeing 747-400 aircraft departing Los Angeles International Airport and Hartsfield-Jackson Atlanta International Airport to Narita International Airport in Tokyo. For more than five years, Delta has provided Wi-Fi to customers traveling on its mainline aircraft flying within the United States. Delta has three of 16 Boeing 747-400 aircraft complete which also operate between Detroit and Seoul-Incheon; Detroit and Nagoya, Japan; Detroit and Tokyo-Narita; New York-JFK and Tel Aviv as well as New York-JFK and Tokyo-Narita. Customers can access Wi-Fi service with introductory pricing options that begin with one hour passes for laptop users as low as $14.00 and $8.00 for mobile users or a flight pass option, which will keep customers connected throughout their flight, starting at $24.95 for laptop users and $14.95 for mobile users. All of Delta’s 747-400 aircraft will have Wi-Fi installed by mid-2014. Delta will complete the installation of Wi-Fi service on its entire international fleet by the end of 2015 including its Boeing 777, 767, 747, Airbus A330 and trans-oceanic Boeing 757 aircraft operating on international, long-haul routes. Delta and Gogo are in the final testing phase for Wi-Fi on the Airbus A330 fleet. The addition of in-flight Internet for more than 150 aircraft will expand the number of worldwide aircraft equipped with Wi-Fi to approximately 1,000 jets including all two-class regional, domestic and international aircraft. The new international service uses satellites for global connectivity to offer coverage internationally and will compliment Delta’s existing air-to-ground service already provided by Gogo for aircraft flying within the domestic U.S.
Delta operates the world’s largest Wi-Fi-equipped fleet of aircraft with more than 3,400 flights daily, including its entire fleet of 570 domestic mainline aircraft. More than 870 Delta aircraft, including all Delta Connection two-class regional jets, are equipped with in-flight Wi-Fi service offering more than 400,000 customers per day access to the Internet above 10,000 feet. Copyright Photo: Michael B. Ing/AirlinersGallery.com. Boeing 747-451 N663US (msn 23818) climbs away from Tokyo (Narita). This entry was posted in Delta Air Lines and tagged 23818, 747, 747-400, 747-451, Boeing, Boeing 747, Boeing 747-400, Delta Air Lines, los angeles international airport, N663US, Narita, narita international airport, NRT, Tokyo, Wi-Fi on March 25, 2014 by Bruce Drum.